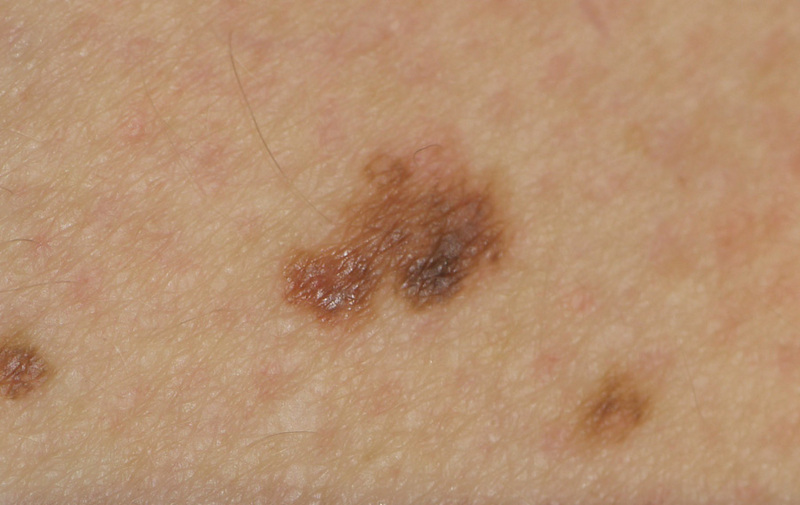 When a patient presents with a suspicious skin lesion the first step is to assess the likelihood of melanoma being present and then to provisionally identify the type of lesion. Surgical excision with histology is the first-line treatment for all skin cancer. It has the highest cure rate among available treatments. Referral, according to local guidelines, to a General Practitioner with a Special Interest (GPSI) in skin lesions, a Dermatologist, a Plastic Surgeon or an ENT Surgeon may be appropriate for patients with large lesions or lesions with an aggressive growth pattern. Patients with superficial basal cell carcinoma or intraepidermal carcinoma (squamous cell carcinoma in situ) may be safely managed with cryotherapy or topical treatments, i.e. fluorouracil or imiquimod creams, when excision is not appropriate because of the location of the lesion or due to cosmetic considerations. Topical treatments should not be considered if the diagnosis is uncertain. Skin cancer is estimated to account for over 80% of new cancers in New Zealand each year.1 The majority of these are non-melanoma skin cancers, i.e. basal cell carcinoma (BCC) and squamous cell carcinoma (SCC). However, as BCC and SCC are not required to be reported to the New Zealand Cancer Registry the impact of these cancers on New Zealand communities is difficult to quantify. Non-melanoma skin cancers are rarely fatal, however, they can grow if not treated early and result in substantial destruction of local tissue and disfigurement. Why does New Zealand have high rates of skin cancer? In New Zealand, approximately twice as many males as females die from melanoma. Males aged over 50 years have a higher incidence of melanoma and tend to present with thicker melanomas, which are associated with poorer outcomes.1, 2 Having an outdoor occupation is likely to be one contributing factor for the increased skin cancer mortality rates among males. Ultraviolet radiation is electromagnetic radiation that, unlike visible light and thermal heat, cannot be detected by the human body.2 UVR is divided in to UVB (290 – 315 nm) and UVA (315 – 400 nm).3 UVB can cause skin cancer by damaging DNA in P53 tumour suppressor genes, which are involved in DNA repair, or by activating genes that promote cancer (oncogenes).4 UVA is present in greater amounts in sunlight and penetrates more deeply into the skin than UVB due to its longer wave length.3 UVA is also able to pass through glass, unlike UVB.3 UVA radiation has been shown to be involved in the carcinogenesis of skin stem cells.3 DNA damage due to UVR accumulates over time and the risk of malignancy increases with age. Differing patterns of UVR exposure are associated with different types of skin cancer in susceptible people. Intermittent, high-dose sun exposure, e.g. during recreational activities, is associated with an increased risk of developing melanoma in younger adults, especially those with many melanocytic naevi (moles) and BCC.5 Cumulative exposure, which is generally higher in people with chronic exposure to sunlight, e.g. 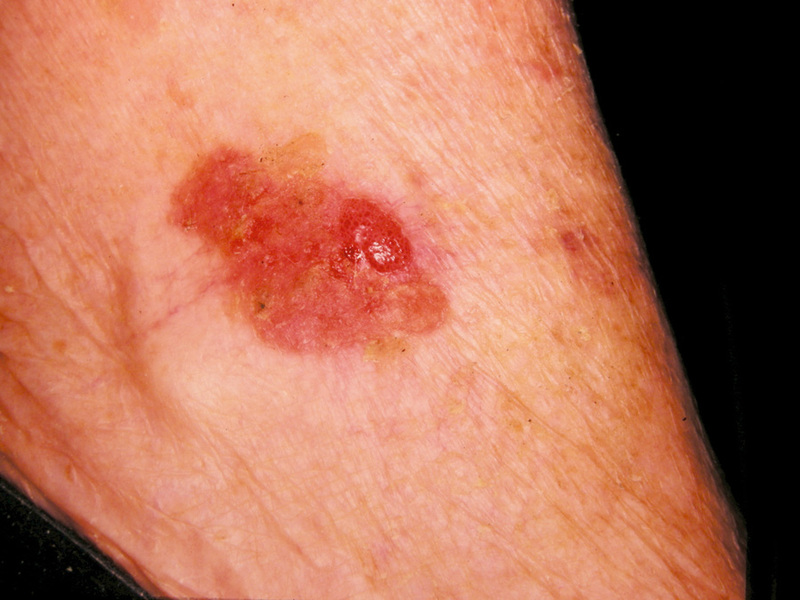 people with outdoor occupations, is the most significant risk factor for developing pre-cancerous solar keratoses and SCC.4 Chronic exposure to UVR can also cause slow-growing melanomas to develop on patches of sun-damaged skin in older people. 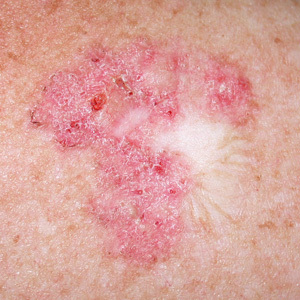 Ultraviolet radiation can cause immunosuppression by: disturbing the way antigens are processed by the immune system, stimulating cytokines that can suppress the immune system and by altering contact and delayed hypersensitivity reactions.3 UVR therefore initiates and accelerates the progression of skin cancer. When a patient with a suspicious skin lesion presents in general practice the first step is to assess the risk of a melanoma being present. 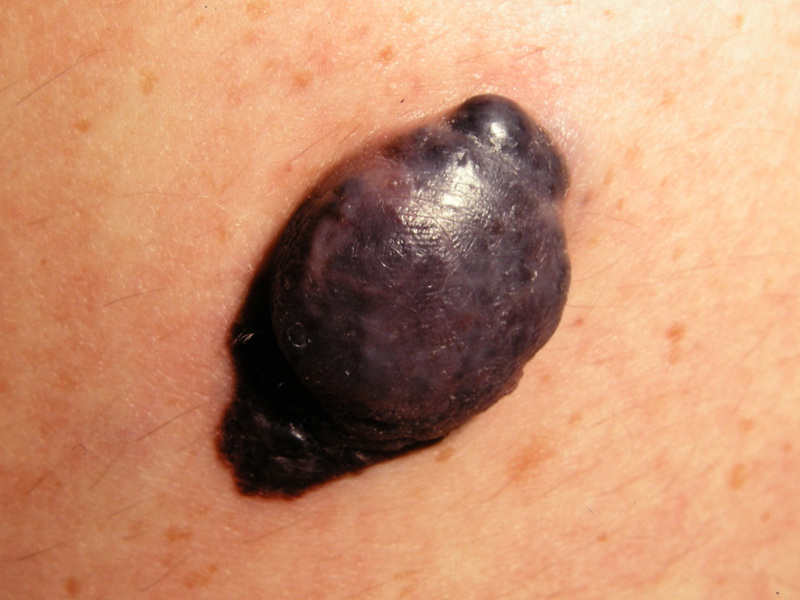 Reassurance should only be given where there is confidence that the lesion is not melanoma. A complete skin examination should be conducted with a good light source and magnification, although another consultation may need to be scheduled for this. 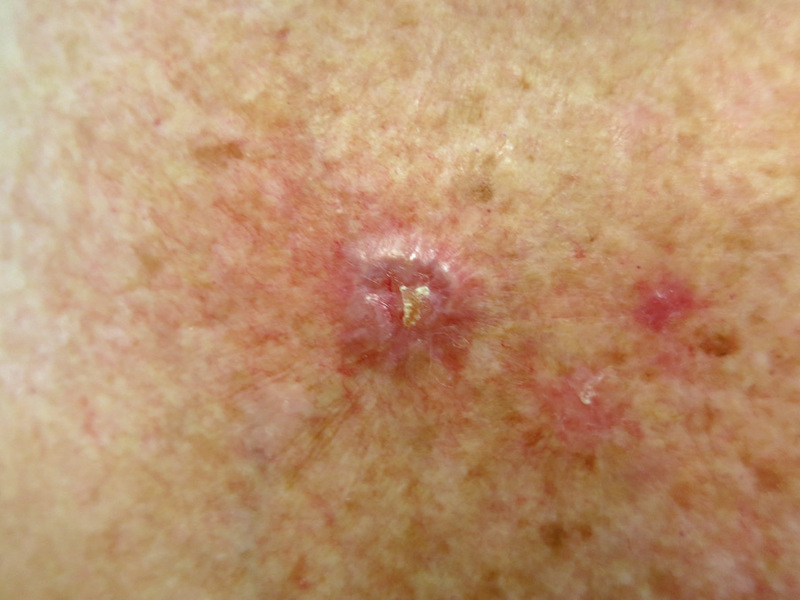 The examination should note the extent of the sun damage and the distribution and morphology of skin lesions. “How long has it been there?” This is the most important question to ask a patient who reports a suspicious skin lesion. If the lesion is new and the patient reports changes over days or weeks then the lesion is likely to be due to inflammation rather than malignancy. 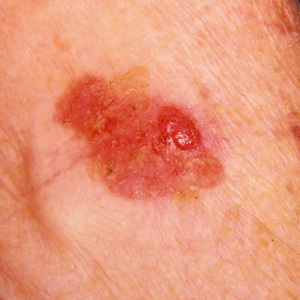 Stable lesions that have been present for years can be monitored by observation at the next consultation and their cancer risk reassessed.9 However, if the patient reports the lesion has developed and persisted over a period of months then the clinical suspicion of either melanoma or non-melanoma skin cancer should be increased. Digital imaging is recommended to assist in identifying changes over a short interval, to accompany requests for histology and to request advice from, or make referrals to, other clinicians. Patients with suspected or known invasive melanoma, i.e. lesions that extend deeper than the epidermis, should be urgently referred to specialist care, and prioritised as having a high suspicion of cancer to ensure they receive treatment within 62 days of receipt of referral. Local guidelines may vary for referral to a Surgical Dermatologist, Plastic Surgeon, ENT Surgeon or General Surgeon. 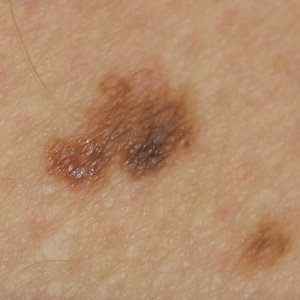 For further information see: “ Detecting malignant melanoma”, BPJ 34 (Feb, 2011). A Cochrane review found that a wide range of topical treatments were generally comparable in the treatment of solar keratoses, however, there was some evidence that fluorouracil cream may be more effective long-term than cryotherapy.11 Imiquimod cream is often tolerated better than fluorouracil and may provide better cosmetic results than either fluorouracil or cryotherapy, however, it may cause hypopigmentation and is unsubsidised for this indication.12 Ingengol gel and photodynamic treatment cause tissue reactions of shorter duration than fluorouracil or imiquimod and have similar response rates. These treatments are not currently available in primary care. Table 1 shows the recommended topical treatment regimens for solar keratoses managed in primary care. 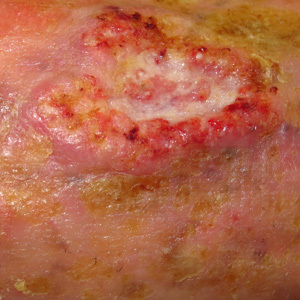 If a patient presents with numerous keratoses and it is impractical to treat all of them, target symptomatic, hyperkeratotic (Figure 4) or thickened lesions with cryotherapy as these lesions have a greater risk of transforming to SCC.10 Treatment of wider areas of skin with fluorouracil cream or imiquimod cream may be appropriate. Ingenol gel or photodynamic therapy is more suitable for flat keratoses or larger areas of sun-damaged skin. It can be useful to freeze thicker, tender lesions two to three weeks before starting treatment as this can increase absorption of topical medicines. Follow-up may be necessary to repeat cryotherapy or biopsy lesions that do not respond to treatment or continue to enlarge. 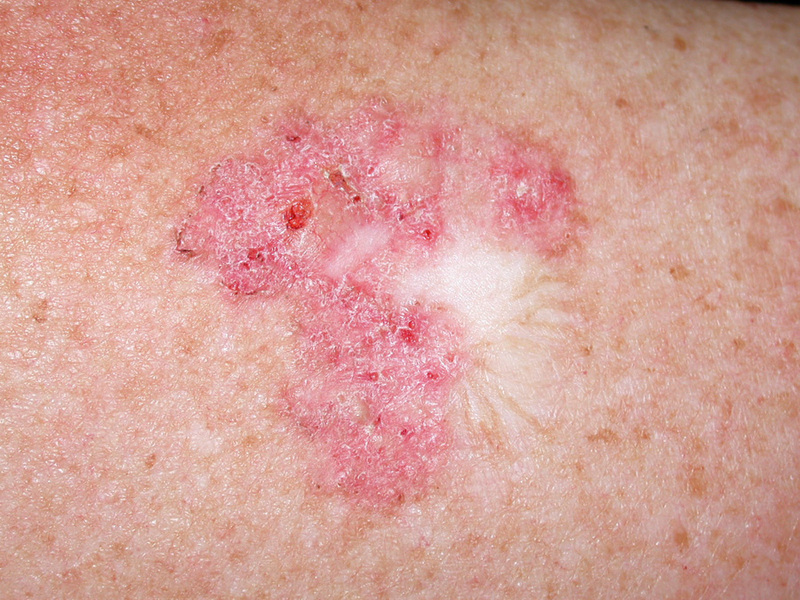 It is important to ensure that persistent lesions are in fact solar keratoses. 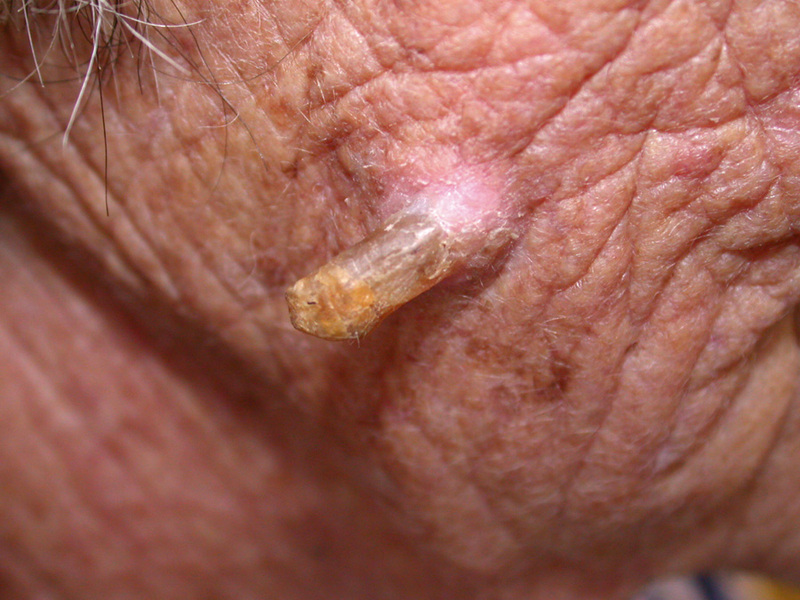 Seborrhoeic keratoses do not respond to topical treatment. All patients with solar keratoses should be advised to protect themselves from the sun year-round and to use high protection, broad spectrum SPF 50+ sunscreens when they are exposed to high levels of UVR. For more detailed information about the topical treatments for non-melanoma skin cancer, see: “Treatment options for cancerous skin lesions”. 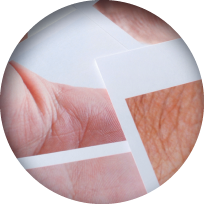 For information on diagnosing suspicious skin lesions using dermatoscopy see: “Diagnosing solar keratoses and non-melanoma skin cancer using dermatoscopy. Keratolytic emollients, e.g. urea cream (10%) Apply to all affected areas, twice daily. Provides short-term symptomatic benefit only. Cryotherapy Apply liquid nitrogen in a single freeze for two to five seconds.13 Repeat in four weeks or as necessary. Cryotherapy can remove approximately 70% of treated solar keratoses, depending on the intensity of treatment.13 Unsuitable for large or numerous lesions. Fluorouracil (5%) cream Apply once or twice daily, for two to four weeks. Monitor weekly. Imiquimod cream (5%) (unsubsidised for this indication) Apply two or three times a week for four weeks to six weeks. Assess local response after three weeks and adjust treatment frequency if necessary. Review again after a four week treatment-free interval. Treatment can be repeated if the lesion persists. Basal cell carcinoma is the most frequently occurring cancer in humans and, although locally invasive, it rarely metastasises and is almost never fatal. People with a personal history of BCC also have an increased risk of developing melanoma. 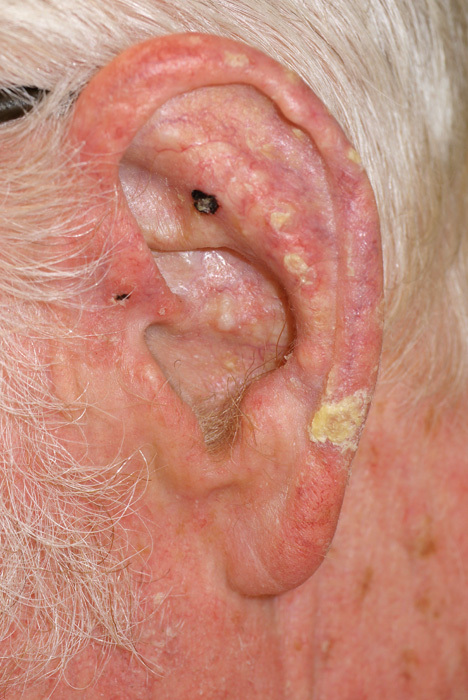 Approximately 80% of BCCs occur on the face and neck, but lesions may also be found on the back of the hands, forearms and on the back and lower legs.14 The classic appearance of a BCC is a “rodent ulcer”, which is a lesion with raised pearly edges and central atrophy or ulceration (Figure 5). A pearly (Figure 6), shiny nodule with prominent capillary networks is common. 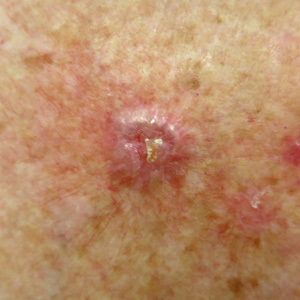 Superficial BCC may also present as an irregular red, scaly patch or plaque with short linear blood vessels (Figure 7). Pigmented forms of BCC may be observed in people with dark skin or people who tan easily. BCCs are generally slow growing over months or years.10 Morphoeic (infiltrative with poorly defined edges) or sclerosing (scar-like) BCCs may go unnoticed until they are several centimetres in diameter and have penetrated deeply. Advanced BCCs may appear as large, deep ulcers. BCC located near the eyes, nose and ear can invade the orbital rim, nasal vault and middle ear respectively and may be larger than expected. Consider early referral of any patient with a BCC in these locations to a General Practitioner with a Special Interest (GPSI) in skin lesions, a Dermatologist, a Plastic surgeon or an ENT surgeon. Surgical excision with histology is the first-line treatment for BCC, as this has superior cure rates to topical treatments and histology results can guide the need for further investigation or treatment. Patients with aggressive, recurrent or large tumours, e.g. 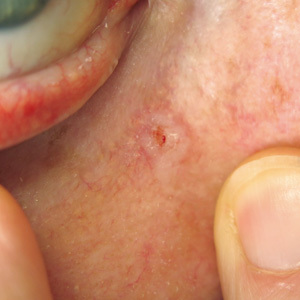 diameter greater than 6 mm on the face,14 may require referral to a Dermatologist for consideration of Mohs margin-controlled micrographic surgery (see: “Treatments for cancerous skin lesions”). Cryotherapy delivered in freeze-thaw cycles (Table 2) is effective at destroying malignant cells in superficial BCC because cellular damage occurs both during the freezing process and during the slower thaw, due to the osmotic gradient across the cell membrane. Superficial confirmed BCC can be treated with imiquimod (subsidised under Special Authority criteria) when standard treatment options, including surgical excision, are contraindicated or inappropriate (Table 2).12 Imiquimod is not indicated for recurrent, invasive, infiltrating or nodular BCC.12 There is insufficient evidence to compare the effectiveness of cryotherapy with imiquimod for the treatment of superficial BCC. Fluorouracil is not routinely used to treat BCC as there is insufficient evidence to assess treatment effectiveness,15 however, occasionally it is used to treat small, very superficial BCCs. Photodynamic therapy is available in some specialist centres for superficial BCC, including BCCs on the face that are unsuitable for surgery. Photodynamic therapy (unsubsidised) can also be used to treat large thin superficial BCCs on the lower leg. Photodynamic treatment for BCC is repeated after one to two weeks. Cryotherapy Apply liquid nitrogen to the skin for 20 – 30 seconds, allow to thaw for three to five minutes, then refreeze for another 20 – 30 seconds. Unsuitable for facial lesions, due to poor response rates, or distal lower limbs, due to persistent ulceration. Recurrence at the lesion margin may develop following cryotherapy. (Special Authority) Apply to the lesion and 1 cm beyond, once daily on five days each week, for six weeks. Treatment should be reviewed by at least the third week, to adjust the frequency of application. After a four week treatment break, treatment can be repeated for another six weeks if the response to the first course is incomplete. Imiquimod can cure 70 – 80% of small, superficial BCCs.10 A punch biopsy should be performed where possible to confirm a diagnosis to qualify for Special Authority subsidy criteria. Imiquimod is indicated for superficial BCC on the neck, chest and distal upper limbs, but it appears to be less effective when used on the distal limbs. Imiquimod can be used to treat facial lesions but as local tissue reaction may be prolonged it may not be a desirable option for all patients. Approximately 80% of invasive SCCs develop on the face and neck, but lesions may also be found in other areas exposed to the sun.14 The clinical characteristics of invasive SCC are dependent on the keratin producing cells within the tumour. Well differentiated SCC appear as firm slow-growing skin-coloured nodules with scaling or a protruding horn (Figure 9).10 SCC that are less differentiated grow more quickly and have an irregular crusted plaque that is often ulcerated (Figure 10).10 Keratoacanthoma appear as symmetrical nodules with a central crater or keratin core. They grow rapidly, reaching a diameter of 2 cm in few weeks. 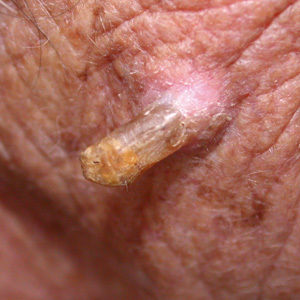 Keratoacanthoma can cause an immune reaction and resolve within months, but may be indistinguishable from aggressive tumours and should be excised. Cryotherapy or fluorouracil can be used to treat IEC where the diameter, location or number of lesions make surgery unsuitable (Table 3). A skin punch biopsy may be considered, if practical, before beginning topical treatment for IEC to assess tumour risk and confirm diagnosis. A Cochrane review found that there was insufficient evidence to compare the effectiveness of cryotherapy with fluorouracil in the treatment of IEC.17 Imiquimod is not registered for the treatment of IEC in New Zealand and there is a lack of quality studies investigating its effectiveness for this condition. However, many clinicians report that imiquimod is useful for treating IEC. Photodynamic therapy is also a treatment option for large flat areas of IEC on the face, neck and lower legs, however, this treatment is unsubsidised and unregistered for this indication and not available in primary care. Fluorouracil (5%) cream Apply thinly to the affected area, once or twice daily, for an initial duration of three to four weeks. Treatment can be applied for eight weeks, or longer. An occlusive dressing should be used to increase penetration if tissue reaction is minimal. (unsubsidised and unregistered for this indication) Apply to the lesion and 1 cm beyond, once daily on five days each week, for six weeks. Treatment should be reviewed by at least the third week, to adjust the frequency of application. After a four week treatment break, treatment can be repeated for another six weeks if the response to the first course is incomplete. 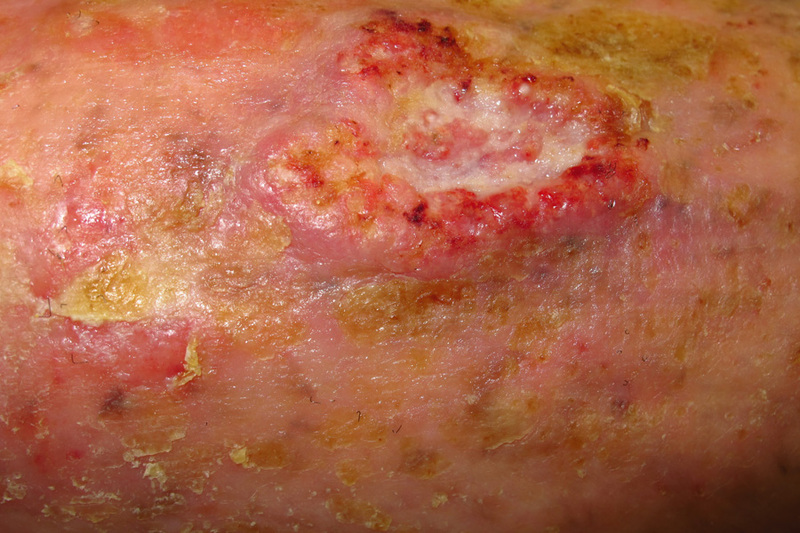 Patients with a history of pre-cancerous or cancerous skin lesions should be advised that the risk of treated lesions becoming recurrent, or new lesions developing, is increased if they are exposed to excessive UVR. Encourage regular self-examination of the skin, using a mirror or involving their partner or carer. Any new or changing lesions should be reported, particularly if they stand out as being different, or are growing, crusting or bleeding. 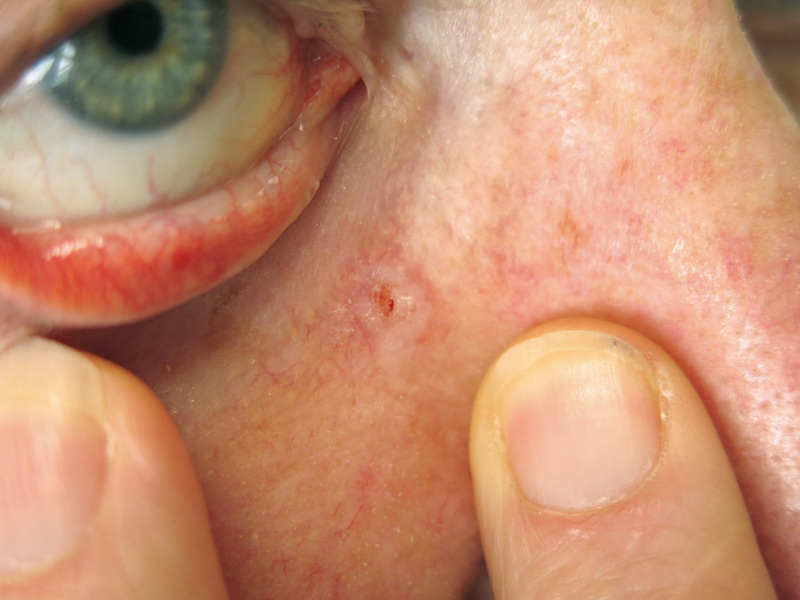 Photography of the lesions may help patients and clinicians with surveillance and follow-up. Dermatoscopy can provide more confidence in discriminating between benign lesions that can be left untreated and malignancy that should be excised. A dermatoscope with strong polarised light and ×10 magnification is used to assess the symmetry of pigmented structures, e.g. lines, dots, circles and clods, and their patterns, e.g. reticular, dotted or without structure. Lack of symmetry of colour and structure, i.e. chaos, indicate a high suspicion of malignancy, once seborrhoeic keratosis has been excluded. 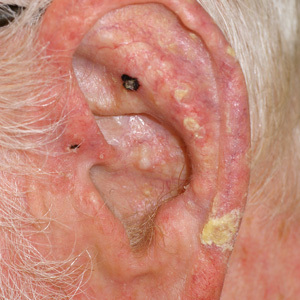 Solar keratoses may contain small, irregular white circles. 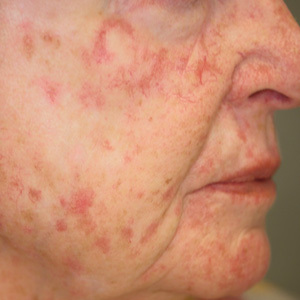 Facial keratoses may contain a “strawberry pattern” of concentric red and white rings. Basal cell carcinoma will show a loss of normal skin features and asymmetry of structure and colour. Microerosions may also be present. Pigmentation tends to be at the edge of the lesion in the form of irregular light brown, grey or blue structures. The blood vessels of BCC appear as branched lines. Polarised dermatoscopy of BCC shows white lines without a pigmented network. Intraepidermal carcinoma shows light pigmentation in a linear array. The blood vessels appear as groups of irregular large, red dots and coils. When considering potential treatments for skin cancer it is important to discuss patient preference as well as the effectiveness of the treatment. For example, an older patient with multiple co-morbidities may prefer not to have a slow growing BCC removed. Surgical excision with histology is the first-line treatment for all skin cancers. This will generally completely remove the tumour as well as guide the need for any further investigations or treatment once the histology is known. 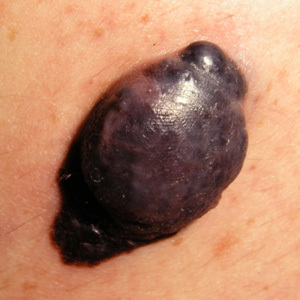 Superficial non-melanoma skin cancer should only require a single excision if an adequate margin of normal skin is removed with the tumour (see below). Excision also has the advantage over topical treatments of being a one-off treatment that does not rely on patients adhering to a dosing regimen. An increased risk of bleeding should always be considered in patients taking medicines such as aspirin, clopidogrel, ticagrelor, dabigatran or warfarin. The use of antithrombotic medicines does not greatly increase the risk of complications due to minor surgery, however, in individual patients, e.g. a patient taking warfarin with an elevated or unstable INR, non-surgical treatment may be preferable. A punch biopsy should be considered for suspicious non-melanocytic skin lesions that will not be surgically removed to confirm a diagnosis and guide treatment.10 However, this is not necessary for low-risk tumours with classical features seen on dermatoscopy (see: “Diagnosing solar keratoses and non-melanoma skin cancer using dermatoscopy”). When performing a punch biopsy, stretch the skin perpendicular to the direction of least skin tension as this will allow for an elliptical wound that is easily closed with a single suture or steri-strip. The biopsy site should be on the wound margin so as to include tissue from the tumour and surrounding, non-affected skin.18, 19 The use of forceps should be minimised when handling the sample as this may crush tissue, making histological analysis difficult. Cryotherapy using liquid nitrogen is widely used in general practice to treat solar keratoses, low-risk superficial BCC or IEC less than 1 cm in diameter on the trunks and limbs.13 Spray devices have the advantage of allowing the freeze to be controlled using different applicators. If a spray device is not available a cotton-tipped stick can be dipped into a flask of liquid nitrogen. The disadvantages of this technique are: contamination, rapid thaw, inadvertent drip, inaccurate application and under or over-treatment. Some degree of hypopigmentation is inevitable following cryotherapy and this may be more noticeable in people with darker skin. Patients applying fluorouracil must avoid exposure to the sun as this can make adverse effects worse; it is best used during the winter months.10 Patients should avoid contact with eyes and mucous membranes while using fluorouracil.12 The use of gloves and/or cotton-tipped applicators when applying the cream is also recommended and hands should be washed thoroughly after application if these are not used. 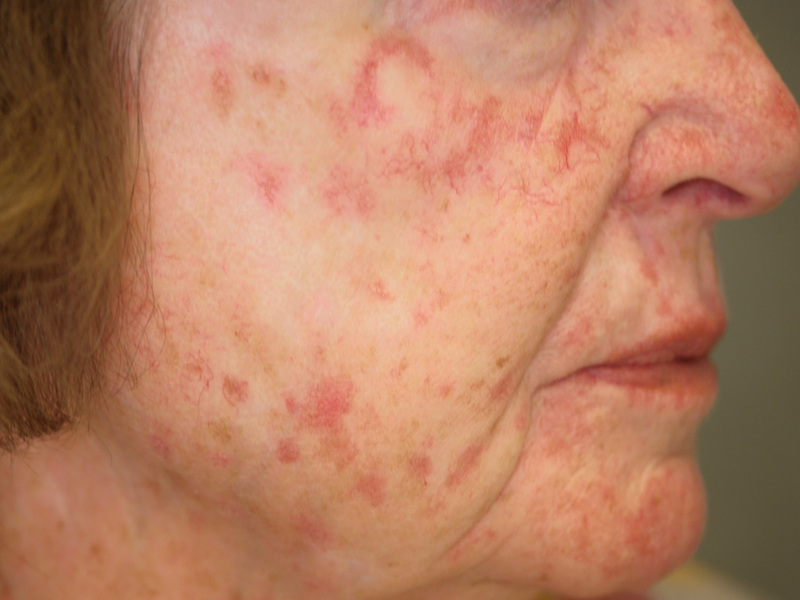 Hyperkeratotic lesions being treated with fluorouracil should be covered with an occlusive dressing, but this is not necessary on thin flat lesions on facial skin.12 Topical use of fluorouracil should be expected to cause local irritation and photosensitivity and may result in permanent hyperpigmentation and scarring. Erythema multiforme may also occur.12 Inflammation is likely to last for one to two weeks after treatment has finished.13 Patients can be reassured that the greater the inflammatory reaction, the more effective the treatment is likely to be, but pain can be substantial and treatment is often discontinued early.12 Severe discomfort that is associated with an inflammatory response may be treated with a topical corticosteroid and analgesia.12 Patients should be advised to store fluorouracil safely so it will not be inadvertently used by other members of the household. Fluorouracil is contraindicated in women who are pregnant or breast feeding and in people with a dihydropyrimidine dehydrogenase deficiency, which slows the rate at which uracil is metabolised. The prevalence of this deficiency is reported to be approximately 3%, however, people who are severely affected by this deficiency are likely to display neurological symptoms, e.g. seizures or intellectual disability.20 Adverse effects due to uracil toxicity following topical application are extremely rare and estimated to occur in one in 100 000 people.20 Fluorouracil should be used with caution in patients with inflammatory skin conditions, e.g. eczema, as adverse reactions may be more severe.12 Dermatitis may also occur in patients with no history of sensitive skin. Photodynamic therapy has a relatively short treatment duration (approximately 15 minutes) and may also reduce other visible signs of photo-damage.20 Adverse effects of treatment may include discomfort and intense inflammation; in these patients pain and pruritus may be reported during exposure. Local anaesthetic, analgesia or breaks in treatment may be required. After treatment a tissue reaction may persist for one to two weeks. Ingenol mebutate gel is an extract of milk weed (Euphorbia peplus) that has been shown to be useful in the treatment of superficial skin cancers and solar keratoses.10 This medicine was registered in October, 2013, and is expected to be available (unsubsidised) in New Zealand in February, 2014. Ingenol gel (0.015%) is applied to the face and scalp once daily, for three days. Ingenol gel (0.05%) is applied on the trunk and extremities once daily, for two days.10 The reaction to treatment is variable and will last one to two weeks. Thank you to Dr Amanda Oakley, Dermatologist and Clinical Associate Professor, Tristram Clinic, Hamilton and Dr Doug Hill, General Practitioner with a Special Interest (GPSI) in skin cancer, Dunedin for expert review of this article. O’Dea D. The costs of skin cancer to New Zealand. 2009. Available from: www.cancernz.org.nz (Accessed Nov, 2013). Cancer Society of New Zealand. Skin cancer: Facts and figures. 2012. Available from: www.cancernz.org.nz (Accessed Nov, 2013). Narayanan DL, Saladi RN, Fox JL. Ultraviolet radiation and skin cancer. Int J Dermatol. 2010;49(9):978–86. Urba W, Washington C, Nadiminti H. Chapter 87: Cancer of the skin. Harrision’s principles of internal medicine. 18th ed. McGraw Hill Medical; 2012. Rangwala S, Tsai KY. Roles of the immune system in skin cancer. Br J Dermatol. 2011;165(5):953–65. New Zealand Guidelines Group (NZGG). Melanoma: an aid to diagnosis. Wellington: NZGG; 2008. Available from: www.health.govt.nz (Accessed Nov, 2013). Australian Cancer Network Melanoma Guidelines Revision Working Party. Clinical practice guidelines for the management of melanoma in Australia and New Zealand. The Cancer Council Australia and Australian Cancer Network, Sydney and New Zealand Guidelines Group, Wellington, 2008. Available from: www.health.govt.nz (Accessed Nov, 2013). National Cancer Institute (United States). Genetics of skin cancer. 2013; Available from: www.cancer.gov (Accessed Nov, 2013). Dixon A, Hall R. Managing skin cancer. Aust Fam Physician. 2005;34(8):669–71. DermNet NZ. Skin cancer. 2013. Available from: www.dermnetnz.org (Accessed Nov, 2013). New Zealand Formulary (NZF). NZF v17. NZF; 2013. Available from: www.nzf.org.nz (Accessed Nov, 2013). Shumack S. Non-surgical treatments for skin cancer. Aust Prescr. 2011;34(1):6–8. National Comprehensive Cancer Network (NCCN). Basal cell and squamous cell skin cancers. Washington: NCCN; 2013. Ormerod A, Rajpara S, Craig F. Basal cell carcinoma. Clin Evid (Online). 2010;2010:1719. Motley R, Kersey P, Lawrence C, et al. Multiprofessional guidelines for the management of the patient with primary cutaneous squamous cell carcinoma. Br J Dermatol. 2002;146(1):18–25. Bath-Hextall FJ, Matin RN, Wilkinson D, Leonardi-Bee J. Interventions for cutaneous Bowen’s disease. Cochrane Database Syst Rev. 2013;6:CD007281. Trent J, Krisner R. Wounds and malignancy. Adv Skin Wound Care. 2003;16(1):31–4. Alavi A, Niakosari F, Sibbald R. When and how to perform a biopsy on a chronic wound. Adv Skin Wound Care. 2010;23:132–40. McGillis ST, Fein H. Topical treatment strategies for non-melanoma skin cancer and precursor lesions. Semin Cutan Med Surg. 2004;23(3):174–83.